We are less than two weeks away from the Premier of the Movie MY RUN, the story of the real life super hero Terry Hitchcock; the 57 year old man who ran 75 consecutive marathons in 75 consecutive days to bring awareness to the struggles faced by single parent families. If you have not yet had the opportunity you need to watch the trailer and get your tickets. March 31st will be here before you know it and the tickets may sell out way before that. If you have already purchased your tickets, or are getting ready to purchase your tickets you need to keep an eye on the MY RUN Facebook Fanpage because they have giveaways going on all the time for those that have their tickets already. 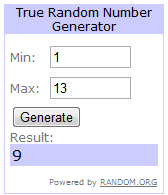 We had 13 entries and I entered them into the random.org website to find our winner. The winning comment was number 9 and the winner was Alisyn from Run In Syn. Congratulations Alisyn! Please send me your shipping information and the theater you will be attending the MY RUN Premier at to info@262quest.com and I will get your information where it needs to go. 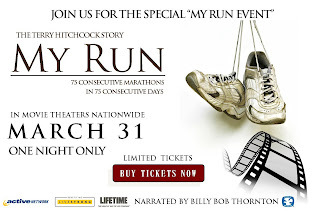 Stop by the movie website at www.myrunmovie.com or their Fanpage for more information. Thanks everybody for stopping by, reading and subscribing!